A different type of “Spice Girls” appeared at the Oswego Middle School on Halloween. Two Oswego Middle School students were accepted into Junior High Area All State Orchestra and Band. 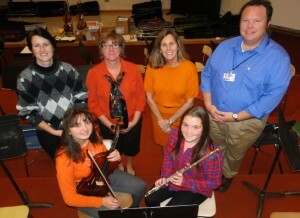 Leanna Restani and Allison Pasco will perform at Cortland Junior/Senior High School this weekend. The students were given very demanding music to learn and will join with guest conductors of the highest caliber this weekend (November 1-2). Friendly’s Restaurant in Oswego will be helping the Children’s Fund of Oswego County make Christmas more memorable for area youth when it hosts a very special Friendly’s Family Fun Day. On November 3, Friendly’s Restaurant in Oswego will donate 10% of all sales that day to the Children’s Fund of Oswego County. A small group of Oswego County representatives recently met with their counterparts in Wyoming County to discuss land-based wind energy. Information from this trip will help guide county leaders should wind power become a consideration in their efforts to help protect the environment and reduce energy costs to taxpayers. Eugene G. Saloga, 86, a resident of East Sixth Street in Oswego, passed away Thursday October 31, 2013, in Oswego Hospital. There’s nothing quite like the look of a child’s face on Christmas morning as they discover their presents under the tree. It’s an experience that many remember for a lifetime. To ensure that that scene plays out in as many Oswego County homes as possible the Oswego County Children’s Fund has begun their annual drive to collect toys for less fortunate children in Oswego County. Oswego crossing guard Keri West got in the mood for Halloween as she dressed for her duty. With the inclement weather it probably helped motorists see her more clearly as she assisted Frederick Leighton Elementary School students.